An encore in my Moleskine that seems to fit this week's word: Fearless. 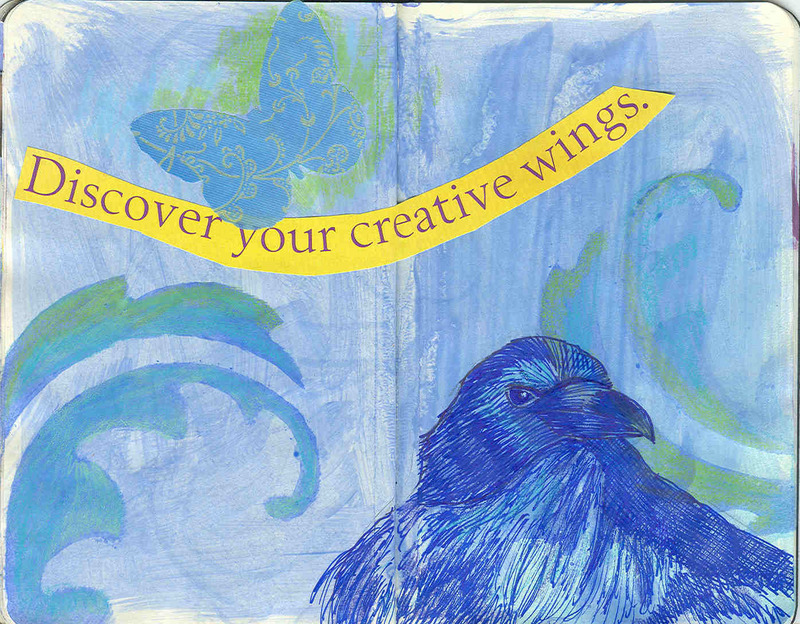 Mixed media: acrylic paint, Prismacolor pencils, words from a magazine, butterfly sticker and a raven drawn with a ballpoint pen. I love this Lolo. The perfect words with your signature crows!! very nice. what do you mean by encore? encore to what? This is just what I am trying to do...be fearless with art...it scares the crap out of you, and I am trying to be FREEEEEE with it! Of course, I am no artisit either!!! Your peice is so pretty... I am addicted to your birds!!! Hey, I got your stamp in my collection...come over and see...I just posted about it!!! I like this idea of "fearless creating"...I was born a frightened being...but you'd never know it today...the little girl who was scared to death to jump off the curb at 2, or swim at 8, or or or...all the ensuing years...sure has jumped into the pool of creating in a huge way. I like this new bravery, gutsyness of mine. I call it having chutzpah! And it feels good. Crazy at times, but brave and FUN too! I love your blue period drawings! Lolo, it's taken me a number of years to get to the "fearless" stage. I love your symbolism of crows. Sometimes people have a negative connotation about them, but one of their many meanings is as a symbol of creativity. Great job on this moleskine spread! He looks fearless for sure. Once, I was truly fearless....but the events of the past year have taken their toll....still, inside, that fearless girl resides....and she is slowly returning to life! Your beautiful work and strong words are in inspiration to me - always! Love it, I don't mind being fearless in my art, but jumping out of a plane, forget Abowt it! Great bird !! Love the new one on your banner also. You go for it girl. very inspiring! thank you for this! THis is fearless and beautiful. Have a great weekend. me jumping into the air and knowing i will fly. Beautiful work--the fearlessness shines through the crows eyes! I was drawn in by the words "fearless creating". It feels so good to create when anxiety is gone and words or objects seem to flow. And then there are the times when anxiety stiffens my mind and fingers. I will remember the words fearless creating at those times, lolo! Thank you for your wonderful Raven...he looks so much like one of the pair who live on my property...you capture the greatness of these birds so well! Wow, I've missed a lot of your posts. Enjoyed catching up about your visits, the photos were so fun to see. Love the piece today.....and your header....beautiful!!!!! Fearless LO~ wonderful images come to mind. You said you'd get back to IF and you have done, so beautifully! Your signature raven in ballpoint is sooo good! Fearless Raven Queen Laurel! Here's to a lovely week!! This is great! I love the creative wings part. I feel now, more than ever, is a time for artists to fly and face their fears of living an inspired and creative life. To have their creativity support their livelihood so the people who do not choose to express and share their creativity and wisdom can be infected by inspiration and gain courage in living a life fulfilled. To me there is no better way than as your drawing says! Wow everything you do is magic! You just have that touch. I love all the gorgeousness! Lolo, I like the New & Fearless Raven on your banner, remarkable inspirational quote by Anisha Shenai, and the eternal flame of burning candle of passion. You are simply excellent and fearlessly creative.